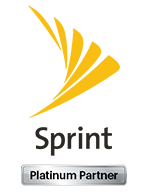 Take your business to the next level adding Sprint wireless services to your portfolio. Bring solutions such as Business Continuity, Wireless Failover, and IoT. Our partners can sell across all business segments (Small/medium business, Enterprise, public sector and federal) with access to a wide variety of resources, products and support. Bring Value, Simplicity and Productivity to Business Sales with a focus on solution selling and a leader in IoT knowledge and partners. You are provided with dedicated resources to help you succeed, letting you concentrate on what matters, selling! As a Partner your business has access to special programs and an attractive commission structure. Including marketing and advertising support and special incentive programs. Sign up to request more information about becoming a business dealer partner. Register now to receive important communications from Sprint announcements, promotions, device launches, pricing changes, and more! If you would like to opt out of receiving Partner Communications emails, please click here. © 2019. Wireless Innovations, LLC.